‘Fruit, below medium size, two inches and a quarter broad, by one inch and three quarters high; roundish, and somewhat flattened, and narrowing towards the apex, a good deal resembling the old Nonpariel. Skin, of a lively green color, changing to yellowish-green, as it attains maturity, and almost entirely covered with brown russet, with a tinge of dull red, on the side next the sun. Eye, small, and closed, set in a shallow, irregular, and angular basin. Stalk, three quarters of an inch long, straight, inserted in a round, even, and russety cavity. Flesh, yellow, firm, crisp, very juicy, with a brisk and rich sugary flavor. [Hogg p.189/1851]. ‘This is perhaps the most valuable dessert apple of its season, it is of first-rate excellence; and exceedingly desirable both on account of its delicious flavor, and arriving at perfection, at a period when the other favorite varieties are past. It is not fit for use till the Ribston Pippin is nearly gone, and continues long after the Nonpariel. The period of its perfection may be fixed from February to June. 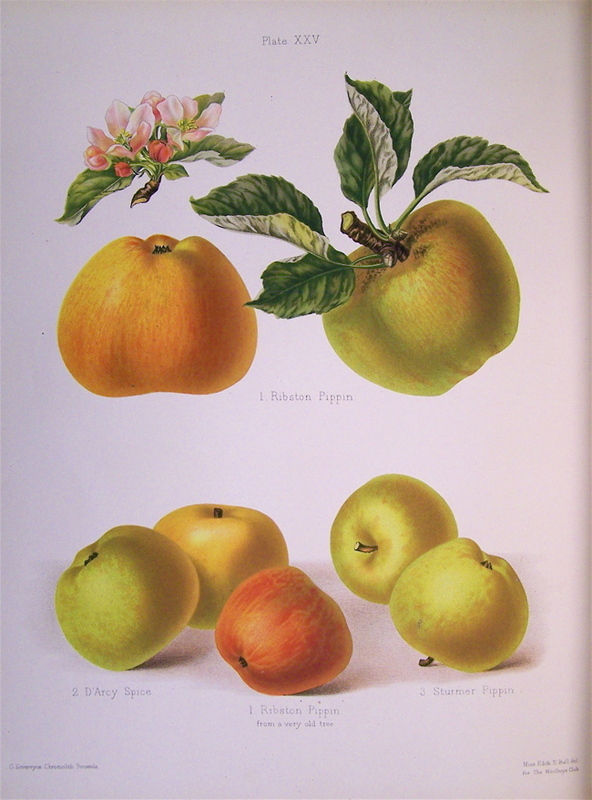 The Sturmer Pippin, was raised by Mr. Dillistone, a nurseryman at Sturmer, near Haverhill, in Suffolk, and was obtained by impregnating the Ribston Pippin, with the pollen of the Nonpareil. The tree is hardy and an excellent bearer, and attains about the middle size.’ [Hogg p.189/1851]. Described and figured in the Herefordshire Pomona [HP pl.XXV/1878]. Listed as ‘Sturmer’s Pippin, apple no.64’ in a hand written list of apples in an 1850 catalogue held at Camden Park [CPA]. Most of the plants hand-written in this catalogue subsequently appeared in the 1857 catalogue. That the apples did not is probably an oversight.